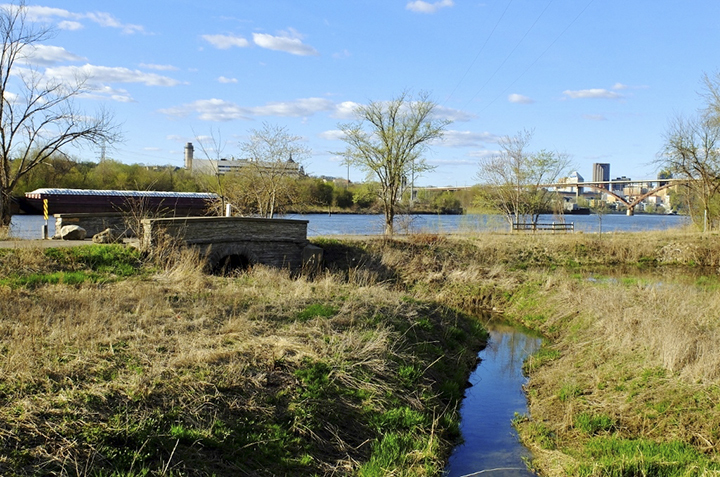 Lilydale Regional Park lies on the south bank of the Mississippi River south of St. Paul. Its 286 acres of river bottom forest are prone to flooding in the spring. It is this seasonal flooding that eventually convinced the residents of the town of Lilydale, established in 1896, to relocate to the top of the bluff. The presence of spruces and lilacs among the usual floodplain trees testifies to the areas urban past. In the summer, lily pads dot the surface of Pickerel Lake. Lilydale Regional Park is part of the Mississippi National River and Recreation Area (MNRRA). MNRRA, pronounced “minnra”, is a partnership park, a new and unique kind of national park. It is a 72-mile, 53,775 acre corridor along the Mississippi River stretching from Weigh Station Highway Park on US Highway 10 in Ramsey to the Dakota County/Goodhue County border. Only two small parcels are owned by the National Park Service. This entry was posted in Uncategorized on April 26, 2017 by John Valo.